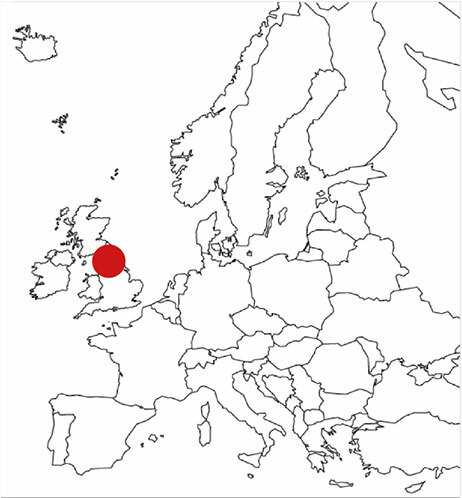 Investigations that had taken place during a change in site ownership, identified the presence of trichloroethene (TCE) at several locations across an operational site, relating to a series of historical losses. Most of the plumes associated with these losses were attenuating, apart from one that originated from the site of a former storage tank, where up to 20 mg/L of TCE had previously been detected (Fig. 1). 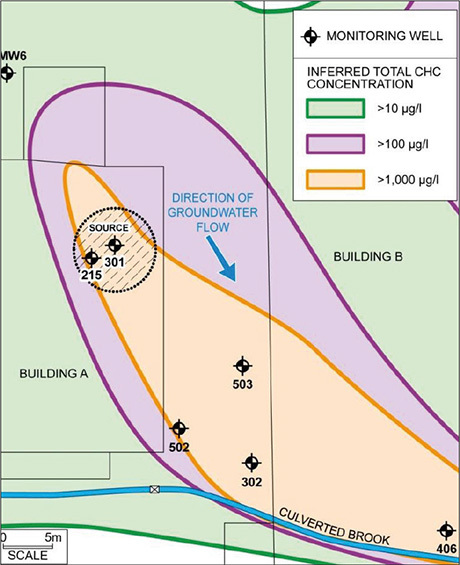 The presence of TCE (but none of its degradation products) was also identified in samples taken from a culverted brook within the site boundary and hydraulically downgradient from the source area, although concentrations had not exceeded the Environmental Quality Standard (EQS) of 10 μg/L. The geological sequence beneath the site comprised between 1m and 6m of made ground, typically consisting of clayey sand with varying proportions of gravel, underlain by alluvial deposits. Shallow groundwater was encountered towards the base of the made ground or top of the alluvial deposits typically at a depth of between 1.8 m and 2.4 m in the proximity of the source area. The inferred groundwater flow regime was convergent upon the line of the culverted brook. A remedial target for TCE of 1000 μg/L was agreed with the regulator (the Environment Agency) as being suitably protective of the brook as the key receptor. The remedial strategy consisted of an injection of Hydrogen Release Compound (HRC®), a glycerol polylactate ester designed specifically to provide in situ enhanced reductive dechlorination (ERD) of chlorinated solvents. This was accompanied by HRC® Primer to acclimatise the groundwater for reductive dechlorination, which was duly demonstrated by successive increases, followed by decreases in the degradation products, DCE, VC and ethene. AECOM’s review of the chemical and geochemical parameters demonstrated that conditions within the groundwater were sub-optimal for reductive dechlorination (Table 1), being slightly aerobic with significant concentrations of competing electron acceptors such as nitrate and sulphate. This view was supported by the relatively low concentrations of cis -1,2-dichloroethene (DCE) in relation to TCE at the site and the absence of vinyl chloride (VC) above detection limits; whilst a maximum concentration of 20,200 μg/L TCE was identified, with DCE mostly non-detectable or below 50 μg/L. No evidence of DNAPL had been observed in previous site investigations. HRC was applied into the subsurface in order to provide a long-term controlled-release source of terminal electron donor into the target area in order to promote enhanced reductive dechlorination of the contamination. HRC Primer was also applied in order to rapidly acclimate the saturated zone. REGENESIS and AECOM’s remedial design had identified a requirement for 52 injection points in total, 10 within the source area and the remainder within the plume at approximately 3 m spacings. Due to access constraints, it was not possible to achieve a uniform grid spacing, however a total of 11 points were located within Building A, encompassing the source area with an additional 42 hydraulically downgradient (Figure 2). 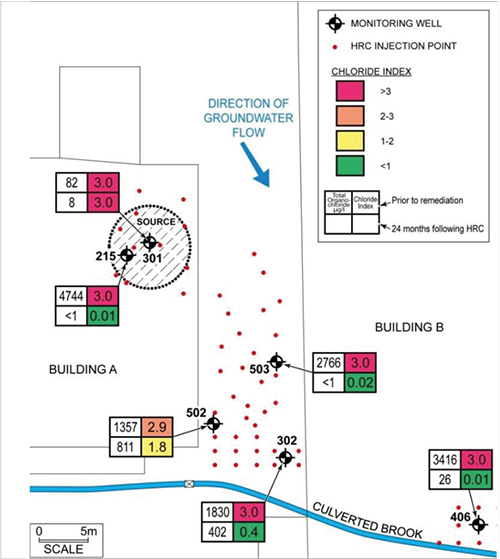 The majority of the latter (34 in total) were installed in a 10m width corridor running between Buildings A, and B, the distance between each point ranging from approximately 2.5 m to 5 m. A cluster of 8 injection points were also installed around monitoring well BH406, located towards the southern edge of the plume within Building B. A single injection of HRC (pre-heated in a water bath to achieve an appropriate viscosity) took place using direct push hydraulic equipment. Drive rods were inserted to the base of the contaminated zone (typically 10 m below ground level) and the HRC was injected across a 5.5m saturated thickness as the rods were withdrawn. 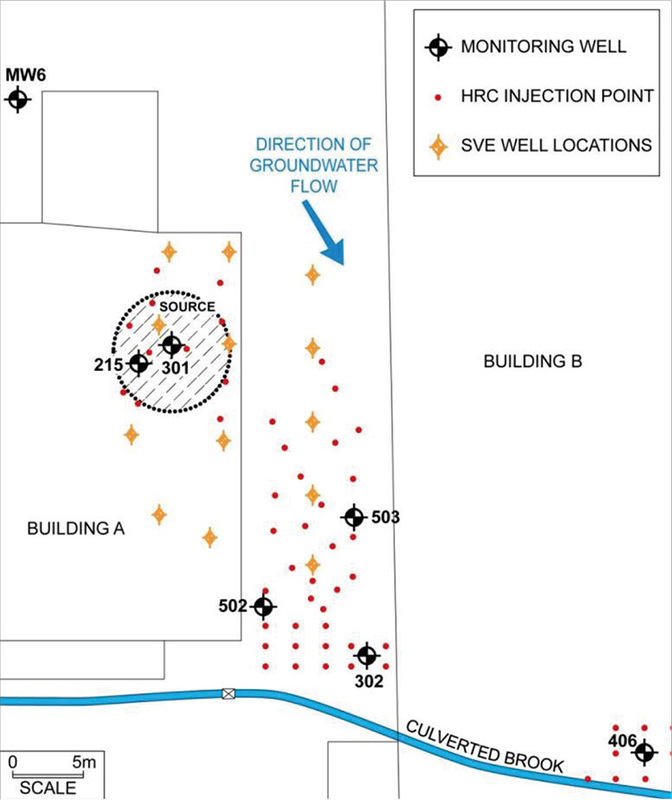 Approximately 422 kg of HRC and 218 kg of HRC primer were injected within the source area, with the corresponding amounts for the remainder of the plume being 4,858 kg and 1,386 kg respectively. To address a localised source of TCE in the vadose zone that posed a potential human health risk, a soil vapour extraction (SVE) scheme was implemented in parallel with the groundwater remediation works to treat an area of approximately 375 m2, which was operated over an eight month period. Groundwater monitoring was undertaken prior to treatment at intervals of one, three, six, 12, 18 and 24 months following application of reagents. The results of the treatment are illustrated in Figure 3 for individual wells in terms of the total organochloride content and the ‘Chloride Index’ prior to and 24 months following remediation. As degradation proceeds the Chloride Index falls: theoretical plumes consisting solely of PCE, TCE, DCE, VC or ethene would have respective chloride indices of four, three, two, one, or zero. As seen in Figure 3, the reduction in total mass of organochloride was accompanied by a substantial shift in Chloride Index in most wells, the exception being well MW301, where less than 10 μg/L TCE was detected. The remedial target was reached or surpassed in all wells after 12 months and concentrations of total CHCs continued to fall over the following year. An order of magnitude reduction in total chlorinated ethenes was achieved within the source area in two years and, despite the initial absence of any significant reductive dechlorination, no inoculation with Dehalococcoides was necessary. After 24 months, concentrations of TCE fell from 2,913 ± 830 μg/L prior to treatment to 49 ± 46 μg/L. Whilst VC (non-detectable prior to treatment) was now present, its concentration (38 ± 26 μg/L) was less than an order of magnitude to that of ethene (540 ± 344 μg/L) after 24 months (mean ± standard error). The soil vapour extraction scheme, undertaken in parallel with the groundwater injection regime, successfully reduced vadose zone concentrations of TCE in soil above the impacted area. The aeration had no effect on redox conditions and no inhibitory effects on reductive dechlorination proceeding within the underlying groundwater. The existing conditions appeared unfavourable for natural attenuation of TCE, with no evidence of Dehalococcoides activity through minimal DCE and the absence of VC and ethene. 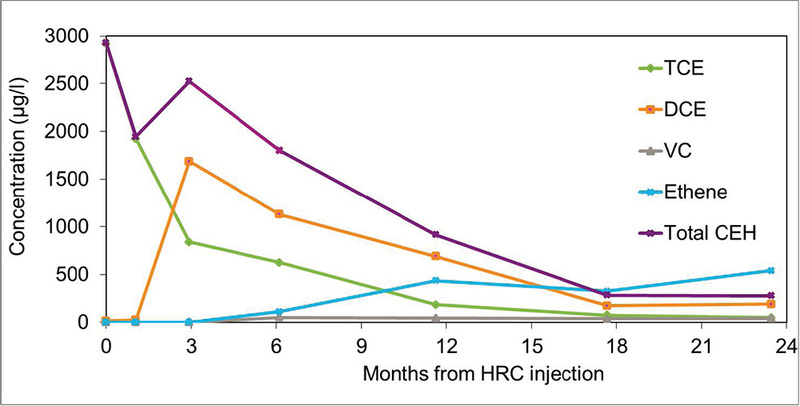 Despite these circumstances, following a single injection round of HRC, a steady mass reduction accompanied by a sequential increase and subsequent decrease of daughter compounds were clearly evident, without any additional requirement for bioaugmentation by Dehalococcoides. This project shows that in situ ERD using HRC is an effective approach at active sites for protecting off-site receptors, despite heterogeneous site conditions and restricted access.